waiting for permission to use image. Born & Baptised: HERBERT ALFRED CHAPMAN COOK. Born: 9th March 1870, St. Philips, Heigham, Norfolk. Baptised: 24th April 1870, at St. Philip’s Church, Heigham, Norfolk. Parents Ellen Margaret & William Chapman Cook – Joiner, of the parish of St. Philips. Died: 20th May 1915; age 45; Died of Wounds at Dover Military Hospital. 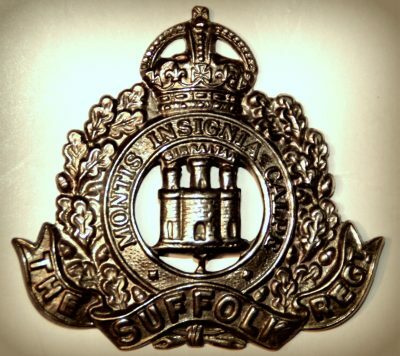 Employed for over 20 years as a compositor by Messrs. Cowell Ltd.
Enlistment Location: Ipswich; Date: 1st September 1914. Wounded – France – 16th May 1915. Relatives Notified & Address: Son of William & Eleanor Chapman; husband of Priscilla Jane Chapman, of 60, Sirdar Road, Ipswich. 1871 3, Gladstone Street, Heigham, Norfolk. Herbert was a year old and living with his parents. William Chapman Cook, 34, a Carpenter. Ellen Margaret Chapman Cook (nee Adams), 27, born Ipswich. 1881 9, Northumberland Street, Heigham, Norfolk. Herbert was 11 years old and living with his parents & brothers. Willie Ernest Chapman Cook, 8, born Heigham. Bertram Percy Arthur Chapman Cook, 10 months, born Heigham. 1891 18, Willington Road, Heigham, Norfolk. Herbert was 21 years old, a Compositor – Print. He was living with his parents & siblings. Millicent Hephibah Chapman Cook, 9, born Heigham. 1901 5, Chenery Street, Ipswich. Herbert was 31 years old, a Compositor. He was married and Head of the Household. 1911 60, Sirdar Road, Ipswich. Herbert was 41 years old, a Compositor – Printer. He was married and Head of the Household. Millicent Bertha Chapman, born January, 1900, Ipswich. Dorothy May Chapman, February 1902, Ipswich. Ruby Cicely Chapman, born March 1905, Ipswich. Arthur Frederick Chapman, born March 1907, Ipswich. Marjorie Florence Chapman, born August 1908, Ipswich. Winifred Laura Chapman, born June 1910, Ipswich. Ellen Mary Chapman, born May 1913, Ipswich. Herbert attended the Boys Model School, Norwich, Norfolk. Soldiers’ Effects to Priscilla Jane Chapman – widow.